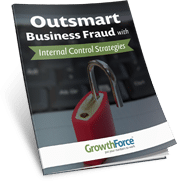 It's a crime if you don't implement best-practice internal controls to protect your business! Check tampering and billing schemes are common in small business, especially when the same person that is writing checks is also reconciling the bank account. We specialize in helping reduce your risk of fraud and will uncover suspicious activities sooner, without adding to your staff or infrastructure. Our disciplined procedures mean fraudsters have nowhere to hide their crime, and that delivers great protection and peace of mind to the business owner. By working in teams with multiple layers of oversight, GrowthForce helps protect against human error as well as fraudulent activities. We also heavily screen each employee, and as added protection, carry insurance coverage for professional liability and employee dishonesty. Your GrowthForce service team will compare and analyze each canceled check, review audit trail reports, lock down prior periods and ensure several sets of eyes are watching your accounts for any warning signs. GrowthForce helps your business improve efficiencies and reduce your risk for fraud by automating your financial systems, streamlining processes and assigning role-based permissions to each accounting process. Additionally, our cloud-based services offer you easy access to important financial information while providing additional safeguards against fraud or failure through SSAE-16/SAS-70 encryption, firewalls and daily-encrypted backups. Strategic internal controls and separation of duties that your business should adopt in order to reduce your risk of business fraud.